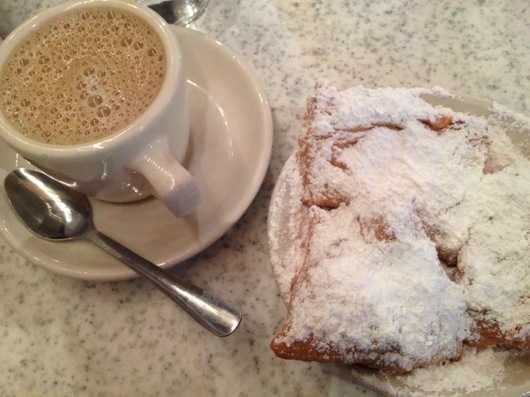 No trip is complete to New Orleans without a trip to Cafe du Monde for beignets and cafe au lait! This was the first stop when we arrived. Although Cafe du Monde is extremely crowded we did not have to wait at all for a table. If you have never visited, just walk in, find an empty table and take a seat. Just be aware that there is powdered sugar everywhere and you will probably leave with powdered sugar on your clothes. But, it is definitely worth it. Happy Valentine’s Day everyone! I just got back from New Orleans and wanted to share a few pics from New Orleans and Mardi Gras. I will be doing a separate post on the food so don’t worry! I had a blast and will hopefully get the chance to go back next year. I hope you enjoy the pics and keep a look out for the next food post.